Inspire Pointe Shoes-Flytes Of Fancy? Remember when the company Inspire came out with a Gaynor Minden-like pointe shoe called the Flyte not too long ago? For some reason, the Flyte pointe shoe popped into my memory today. After watching a video of a dancer going en pointe in these new-age ,yet albeit rubbery-looking shoes, I was prepared for comments galore across forums and ballet-related communities online. After the Gaynor Minden verbal riots of whether shoes like these are “cheating” the traditions of ballet, I was prepared for another uprising with the creation of the Inspire Flyte. What happened? Why is everybody so quiet about this brand? Here in the U.S. the silence has been deadly. Nobody is mentioning the Flyte pointe shoe or the other space-age stuff ( like toe putty) that Inspire has come up with on their Futureofdance.com website. Perhaps it is because Inspire is based in the U.K., I don’t know. Could it be that the ballet world is not suffering the shock of futuristic pointe shoe materials like it did when Gaynor Minden dared to change from paste to polymers? Who Is Dancing In Her Flytes? I, for one, would love to know who is actually using this shoe as her perfect brand. Of course the best thing for me to do if I am so curious is to go ahead and order a pair to examine them myself. As a paste traditionalist, I will have to have an open mind about shoes constructed with these types of materials. Either way, watching the Inspire Flyte video is provocative to say the least. *Update 12/14/17-The official website for Inspire-Flyte @ futureofdance.com is no longer published online. I have removed the link from the sidebar. 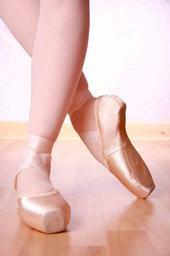 This entry was posted in Ballet Writing and tagged Flyte pointe shoes, Inspire Flyte ballet shoes. Bookmark the permalink. I read about these shoes too, and I co nfess what caught my eye was the leopard-print exterior! Being able to switch out fashion fabrics amused me! (I have the Sansha brocade ones). These are not “pretty” shoes, they look clunky and the roundish platform, I dunno. Still haven’t seen the vid of the dancer, just the description of the shoe, which seems cool! One of their retail outlets is DUBAI! But nothing in the west outside of the UK. Maybe it’s just not a successful product? I agree about the clunky look..especially around the toe box. I believe the video showing the dancer is on a site called Vimeo. The sides of the shoe gape open in a very unaesthetic way during demi pointe and there appears to be a great deal of wrinkling going on in the fabric. Sound interesting! I think in the Ballet World we are a bit hesitant about breaking from tradition. They might have been more popular in a variety of shapes. length of vamp etc. Hey Guys, I currently have a pair of Flytes on their way to me! As of yet, they are still being tried and tested so they aren’t actually for sale publicly. The reason there is a Dubai Outlet is because that is where they are manufacturing them I believe as the maker has contacts there 🙂 If you like, follow me on twitter and I will be uploading photos of them the moment they come and also I’ll be writing a review. I imagine they will be a big change to my current Suffolks but I await them with great anticipation!! 😀 My twitter is iamblond_e ❤ btw I'm in Wales, UK!! Hello and thanks for the information. Now it makes sense that no one is talking about them. This is fascinating. Pointe shoe making is becoming more global everyday. Who would have guessed that Flytes are made in Dubai? I am very tempted to open a twitter account to see your shoes when they come in. American dancers would love to see a photo of a real pair of Flyte pointe shoes. the Flyte shoe has been a long time in the making and is just coming to market in the UK this summer (2012) – the delay has been to alterations that we have made to increase lateral stability and improve the feel of the floor – we have been trialing the shoe constantly with pre-professional and professional dancers to make sure we have a shoe that is totally functional for dancers. Also finding retail outlets who are willing to take a risk on a non-traditional shoe during a recessio has also been hard – selling via the internet is a no-no obviously as the fitting is all important. We will have 5-6 outlets in the UK by the summer and aim to gradually expand over the year to other countries. So sorry about the delay but we really wanted a finished shoe that both professional and recreational dancers enoughed dancing in. Refusing to sell the shoe on the internet is a huge business mistake. Advanced and professional dancers know EXACTLY what they need in a shoe and consume a lot more shoes than students. Provided you can post a size chart vis a vis your product and other brands as well as describe the box shape, more orders will come rolling in than could ever be obtained by a few hundred students visiting a handful of retail locations. Furthermore, there are very few real “fitters” out there – many fitters and teachers only worry about putting students into a shoe whose size fits, rather than also searching for the right shoe for the student’s foot TYPE – that is an art few have mastered, so best not to bet your whole enterprise on that! Hi, I haven’t tried the shoes but I have tried the shoe goo which is fabulous! Imagine having exactly the padding you need in the places you want it that’s what this is. It’s kinda like squidgy polystyrene, I would advice you though to only get it in white. I didn’t get to choose the colours and had blue first which when I sweated stained my tights something awful! Where do you order these shoes?